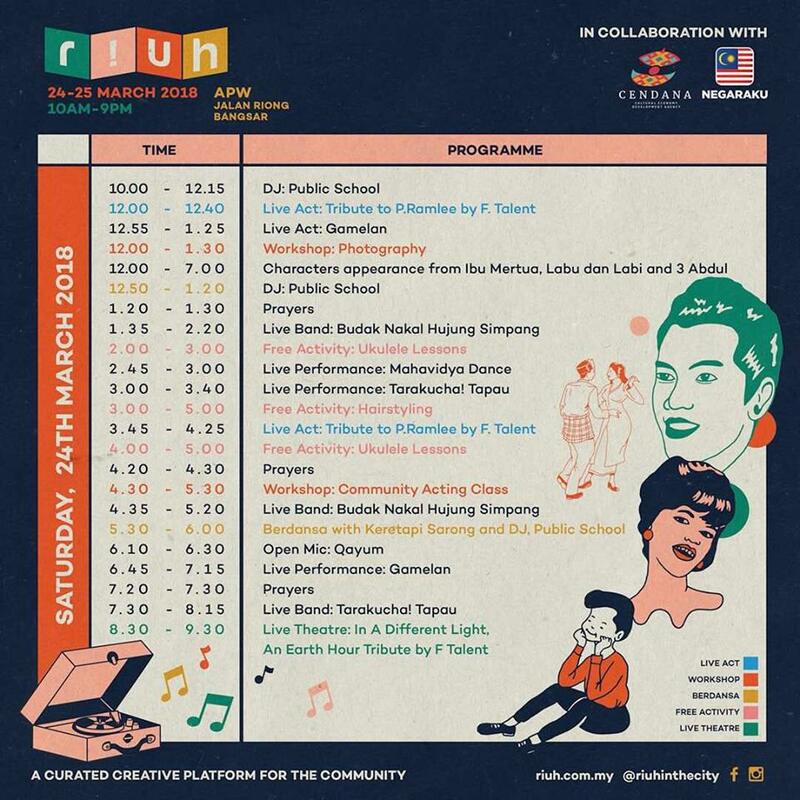 Home / budak nakal hujung simpang / busker / f talent / ferris musics / international women's day / mahadivya dance / malaymail / music / news / p ramlee / rapsodi gamelan / retro RIUH / sean ghazi / tarakucha / Retro RIUH to tribute P. Ramlee legacy this weekend! 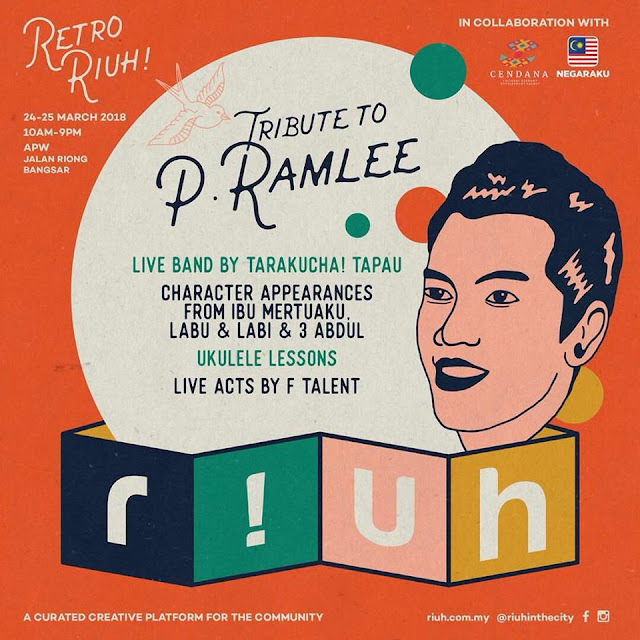 Retro RIUH to tribute P. Ramlee legacy this weekend! This year’s edition of Retro RIUH goes back in time to the glory days of well-known local filmmaker and actor, Tan Sri P. Ramlee and other retro happenings this 24 and 25 March at APW Bangsar from 10am to 9pm. Choose from the varieties performances and activities to join in on. The weekend will be filled with curated performances ranging from live acts to food stalls, giving you the best of what the local scene has to offer. The Cultural Economy Development Agency (CENDANA) is also making a move to spread the news of the talents within our local visual arts scene with their “Art In The City” initiative, where visitors get to vote for the best artwork of buildings in KL. Retro RIUH will be filled to the brim with workshops of all sorts such as acting workshops taught by F Talent, photography basics by All is Amazing, coffee art by KL Sketch Nation and ukulele lessons guided by Ferris Musics. There will also be a tribute to International Women’s Day for the ladies with retro-styled salons and photo sessions, all for free! 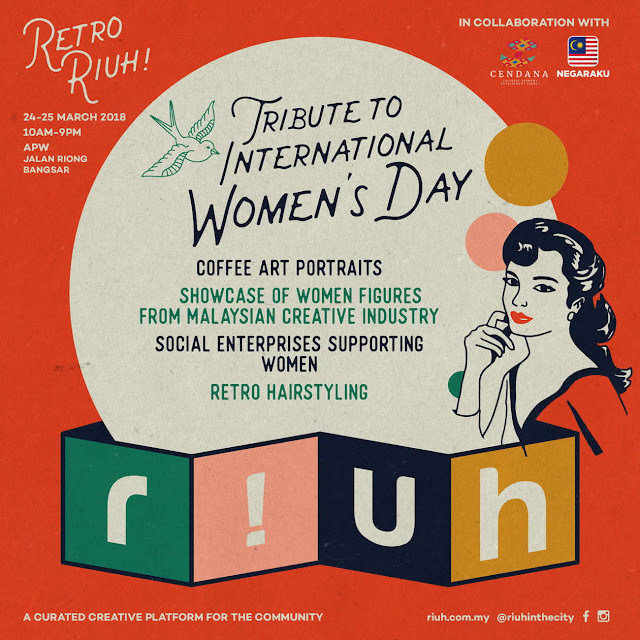 RIUH is bringing a throwback to International Women’s Day. 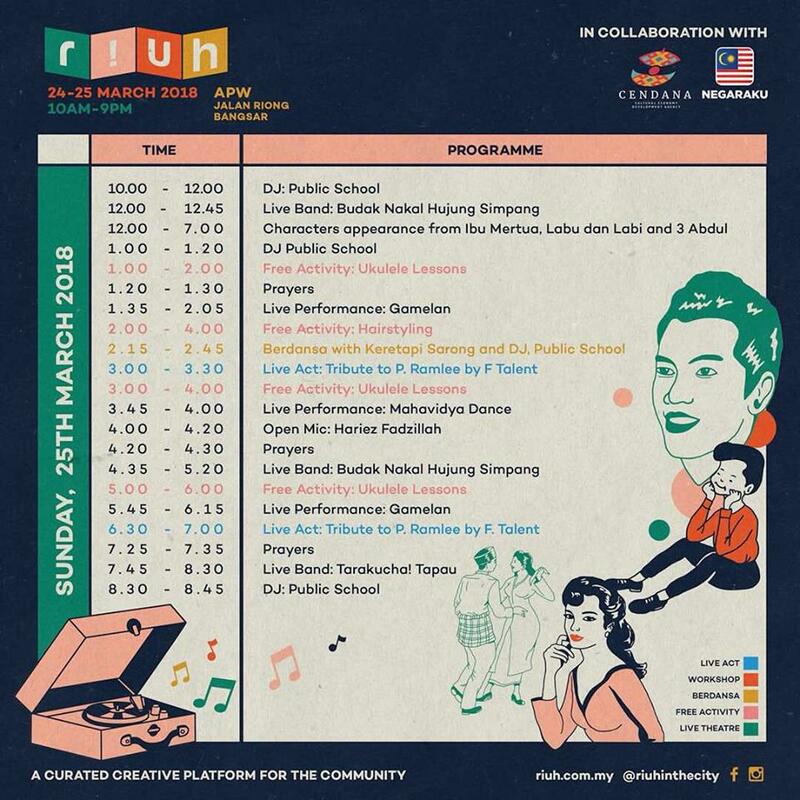 Longtime fans of P. Ramlee would be hyped for this: Sean Ghazi and his band, Tarakucha, will be performing music dedicated to P. Ramlee’s historic works. 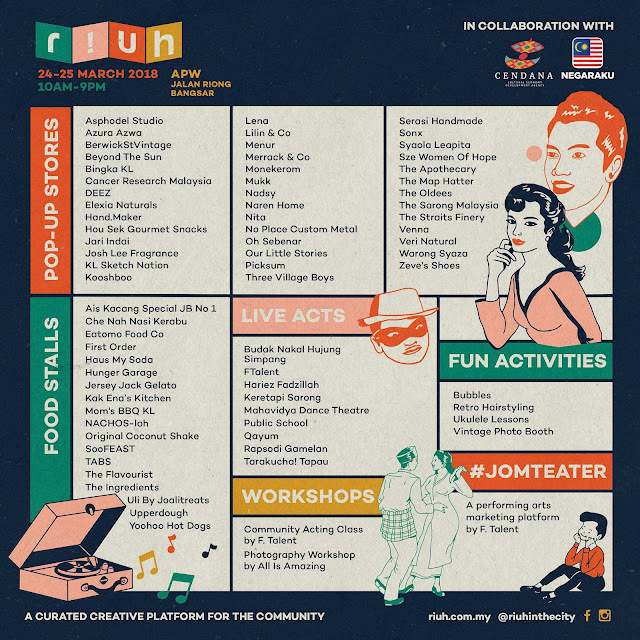 It doesn’t stop there, as iconic characters from P. Ramlee films will also be brought to life at in an exclusive interactive performance brought to you by F Talent called #JomTheater which starts on 24 March from 12pm to 6pm. Reminisce the classic works of P. Ramlee. Music lovers get their share of fun and excitement too as RIUH brings in live performances on both days by amazing local talents such as: Budak Nakal Hujung Simpang, Public School, Rapsodi Gamelan, Mahadivya Dance, Keretapi Sarong and Buskers. Schedule for activities on Saturday. Schedule for activities on Sunday. Also, relive Earth Hour as RIUH brings you “In A Different Light”, an experimental theatre show directed by Helena Foo which will be held on 24 March from 8pm to 9.30pm. There are also things outside of culture, dance and music with Bas Tak Sekolah, a school bus filled with books of all sorts, ready to enlighten your mind with the knowledge they have. 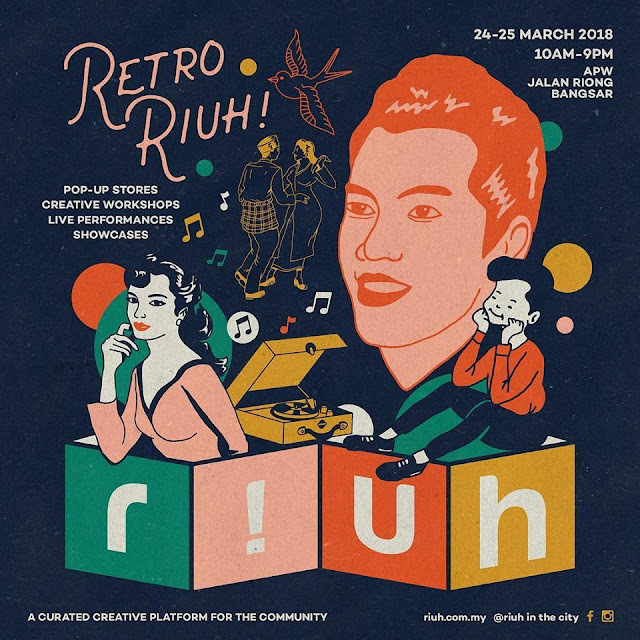 Visitors can take a break at Kopitiam RIUH too, so feel free to chill out and reenergise after going all out with all the fun activities at Retro RIUH.